You may receive updates from Common Cause, Daily Kos, MAYDAY America, Americans for Democratic Action (ADA), Blue Future, Brave New Films, California Clean Money Action Fund, Courage Campaign , Citizens for Responsibility and Ethics in Washington, NARAL Pro-Choice America, People Demanding Action, Progress America, Voter Rights Action, Free Speech For People, Friends of the Earth Action, End Citizens United, People For the American Way, Community Change, LegitPAC, CREDO Action, Corporate Accountability, Stamp Stampede, American Promise, League of Conservation Voters , League of Women Voters of the United States, Franciscan Action Network, The Voter Participation Center, Clean Water Action, and Let America Vote, the sponsors of this petition. Voters delivered a mandate -- and an opportunity -- to move our democracy forward. It’s time for Congress to listen. We need a democracy where voters are protected from discrimination and can make themselves heard at the ballot box. A democracy where electoral districts are drawn fairly, so that every voter’s ballot is worth the same. A democracy that isn't bought and paid for by the highest corporate bidder. And a democracy where ordinary Americans -- more women, people of color, and working people -- can run for office without relying on special interest Big Money. Just imagine what a Congress that took our democracy seriously could accomplish. We must ensure that the For The People Act (H.R. 1), which the House of Representatives is introducing, is the strongest package possible of democracy reforms -- to make sure government works for all of us. These solutions are already working in states and cities across the country -- many of them passed by ballot initiative with strong bipartisan support -- and we can’t let special interest groups and others who prefer the status quo stand in our way. We The People overwhelmingly demanded change through our votes this fall. We want a government that works for all of us -- that gives us all a say and puts our needs ahead of special interests. Now, it’s up to Congress to take action. We want our elected officials to support the For The People Act (H.R. 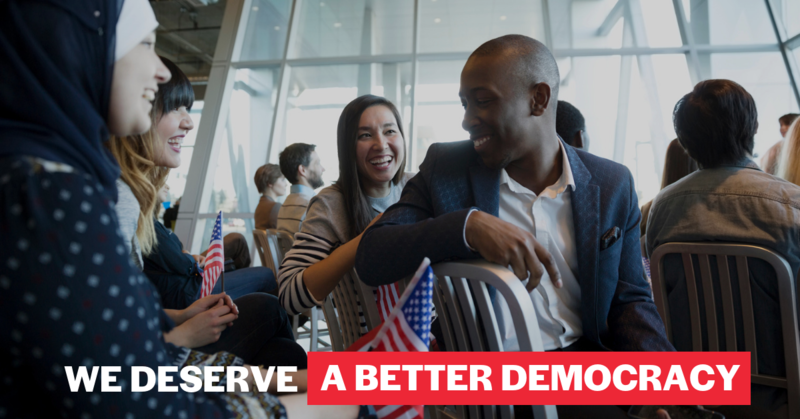 1) and make sure it's a bold, comprehensive package of democracy reforms including: independent redistricting commissions, citizen-funded elections, closing the revolving door between government and corporate interests, and protecting voters against discrimination.